Hendrik Avercamp (1585­-1663), called "de Stomme van Kampen," a deaf­mute, early showed his artistic talents, which he developed to great proficiency to depict the populous winterscapes of Dutch canals. 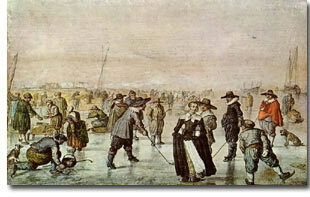 A busy, motley throng of skaters and sledgers, burgher and boor, show life and motion in the still, freezing air under the thinly-veiled sky. He still lacks the refined modulations of tints and the delicacy of aerial perspective which developed later.